Your chilled wort needs oxygen to keep the yeast healthy — here’s how to deliver it. Five hundred years ago, almost all British beers existed as both stale and mild ales. From its earliest use through the 18th Century, the term “mild” referred to an entire class of ales. These beers were much bigger than today’s mild (perhaps 20 °P or more) and they were served young and sweet with residual malt sugars. Any beer could be called mild as long as it lacked the sourness of aged beers, such as stale or stock ale. The Wiz makes waves in an answer about well water. Some brewers aren’t done when their beer is in the bottle — their fun is just beginning as it’s time for designing a beer label. Drawn from hundreds of entries, we present the winners of this year’s label contest. Want your Belgian beers to look as good as they taste? 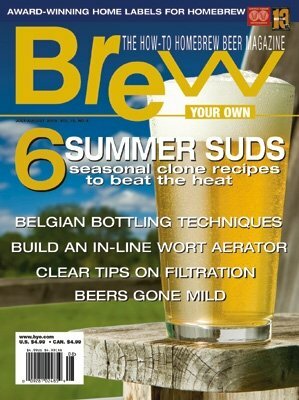 Find out the tools and techniques required to package your beers just like the Belgians do.